Every year the President of the Republic of the Philippines, opens the resumption of the joint session of the Congress to report on the status of the nation in what we call the State of the Nation Address (SONA). Early this morning a handful of Greenpeace volunteers and concerned citizens together with Fr. 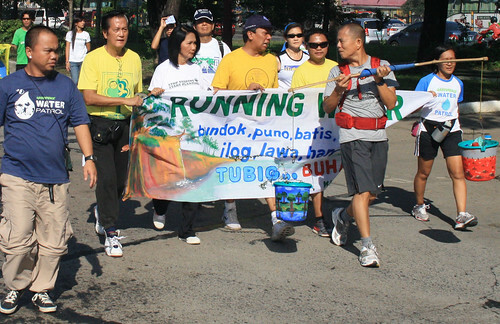 Robert Reyes, Former Representative Nereus Acosta and Former Department of Environment and Natural Resources Secretary, Bebeth Gozun braved Commonwealth Avenue, in Quezon City all the way to Batasan Pambansa, starting their march from Quezon City Hall, where Fr. Reyes was able to speak about the ‘real state of the nation’ in as far as the water crisis that Metro Manila and nearby provinces in Luzon are experiencing as the Angat Watershed’s dam reached a historical low of 157.55 masl last July 16 despite the rains, triggering interrupted water supply in Metro Manila. Prompting water utility companies to implement a water rationing scheme to address the dwindling volume of water in the reservoir.